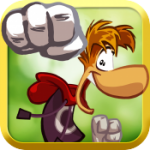 Rayman Jungle Run ($2.99) is now my favorite iOS auto-runner. Granted, I wasn’t the biggest fan of the genre, especially those with procedural, unending levels. Luckily, Rayman Jungle Run offers 40 distinct levels that require players to jump, hair-copter float, wall run, and punch or kick their way to the goal. Each of these four overarching worlds tacks on an ability, and three of these worlds play out with tap-anywhere controls. However, the punch mechanic, used only in the final world, is relegated to a virtual button on the lower right. Getting to the 40 goals is the easy part and adds up to less than an hour of pure gameplay. Getting 100 Lums per level, though, requires hours of practice. Each perfect level earns players a red gem-tooth, and five teeth unlock one crazy-hard race per chapter. No Lums are in these Land of the Dead levels; it’s all about reaching the end for the final tooth and getting the fastest time to place on the leaderboard. Speaking of leaderboards, none of the other stages are timed for online racing, which almost seems like a missed opportunity. Other than meeting achievement goals, going for 100 Lums in stages unlocks an image gallery full of characters from Rayman Origins. This feels rather bittersweet, as seeing the characters creates nostalgia but serves to remind players what’s missing from the Origins universe. How would this auto-runner incorporate bosses? I don’t know, but I think the brilliant minds behind Rayman could have found an innovative way. A few extra music tracks also wouldn’t hurt, as they played randomly and grew a little stale after the first hour of playing. These tracks are probably enough for casual plays, but not for those who play over and over to perfect every level. That said, the overall lack of new assets made more sense when I realized Pix’n Love Rush creator Pastagames actually developed Rayman Jungle Run and not the original Ubisoft team. Fanboy-like complaints aside, Rayman Jungle Run is the most thrilling, gorgeous, charming, and responsive auto-runner I’ve ever experienced. The stages whip and zip like a rollercoaster set at a perfect speed, which allowed me to take in each colorful character and background. Each level, while less than a minute long, felt large. 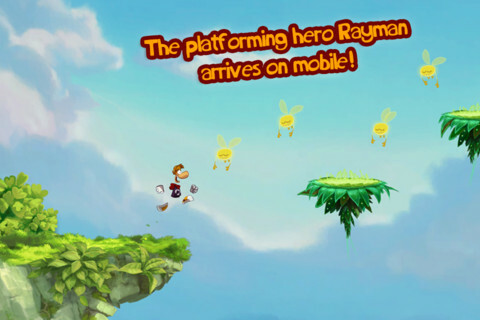 In whatever direction Rayman was running, jumping, or floating, I felt like I was exploring nearly every inch. I don’t believe collecting all 3,600 Lums in one play without dying is reasonable replayability, but I will happily pay for more levels to explore. Sadly, the title screen lacks a DLC button to hint of any forthcoming content. For people who’ve never experienced Rayman or those who have strayed from the series, this is an excellent (re)introduction. For those who’ve played Origins, this may feel a bit mechanically and aesthetically familiar. 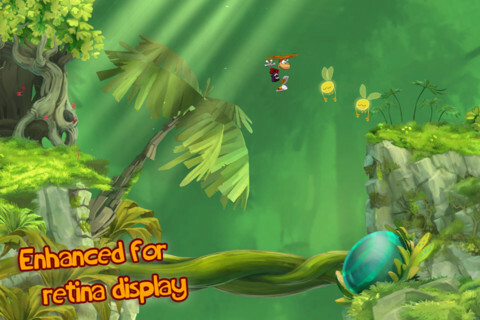 In the case of Rayman Jungle Run, familiarity isn’t a bad thing, especially when it stems from creator Michel Ancel.